Apply Online *No Admission Application fee is required. If you are using the online application for the first time or it has been more than 30 days since you accessed the online application, you will need to create a temporary login ID. Click New User, complete the information requested and click Submit. If you are returning to the Application for Admission after having saved it (but not made your final submission to the College) click on Returning Users. To review or complete an existing application, click Review. To complete a new application, click Apply. To begin the application, click Apply Now on the Apply for Admission page. If you submitted an application or attended any other Virginia Community College that means you already have a Student Identification number which is known as Student ID, please use your existing Student ID. Carefully read and complete each section of the application, click ‘?’ for the directions for filling in text boxes. You are not required to provide your Social Security number, but it is highly recommended. If not provided, your access to many of the College services will be limited and tax reporting information will not be available. Your Social Security number is required when applying for Financial Aid. Left side-bar menu may be used to view the status of each section of the application. A green highlighted number indicates you have completed that section. a. Name - Enter your current, complete legal name using uppercase and lowercase letters. If you reapply and your name has changed, you will not be able to enter the new name. Enter your previous name and then contact the Student Services Center to change it after your application has been submitted. b. Former Name - Enter the name you used in the past. c. Social Security Number - You are not required to provide your Social Security number, but it is highly recommended. If not given, access to many services will be limited, tax reporting information will not be available and it is required for Financial Aid. d. Date of Birth - Select the month and day of your birth. Enter your four digit birth year. f. Type of classes will you be enrolling - Select the CREDIT career if planning to enroll in classes for which you will receive college credit. Select the Non Credit career (Workforce Development) if planning to enroll in classes identified as non-credit or Workforce Development for which you will be earning continuing education units or no college credit. h. Term you plan to begin classes - Select the term you would like to enroll in classes. i. 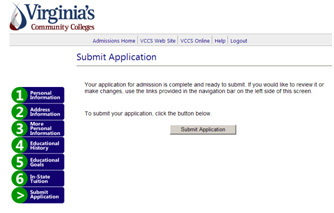 Have you previously attended, applied for admission to, or been employed by any Virginia Community College - If you previously attended, applied for admission or were employed by a Virginia Community College, you have an existing Student ID. j. If you know your Student ID, select Yes and enter the number in the field provided. 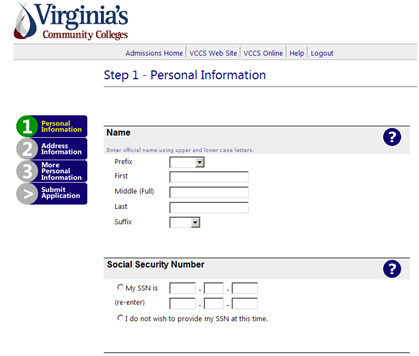 k. If you are a new student and have never been associated with any Virginia Community College, select No. l. Click Save and Continue. a. Mailing Address - Enter the street number and name on the first line. Enter an apartment number on the second line. Do not add both a street address and PO Box. b. Current Residence - Select the city, county, state or country of your current residence. 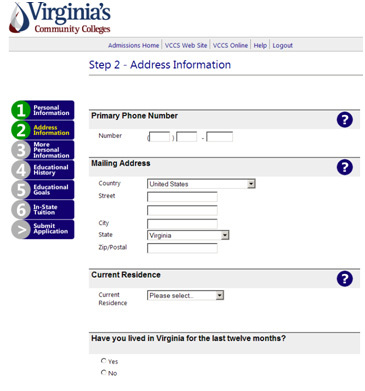 c. Have you lived in Virginia for the last 12 months - Select Yes or No. If No, select the state or country of your previous residence. d. Email Address - If you do not have an email address, leave it blank. If you have one, enter it. e. Emergency Contact Information, Employer and Business Phone Number - This is optional. If desired, enter the information. 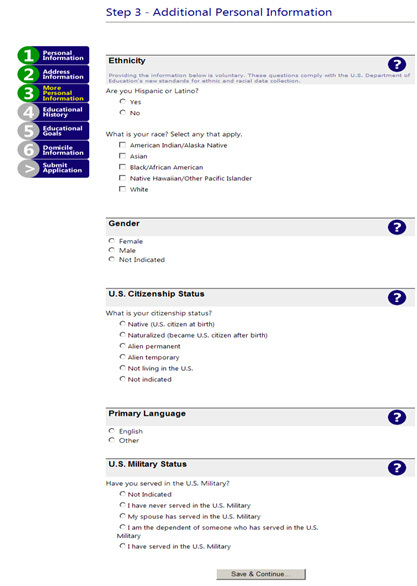 For Ethnicity, Gender, Citizenship, Primary Language and Military Status, select the appropriate values. Non-U.S. Citizens must provide immigration documentation to Student Services Center regarding their status. 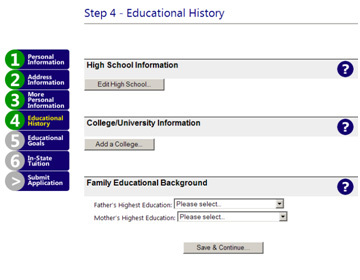 High School Information -- Click Edit High School and select the appropriate high school level. If you attended or are attending a high school in the U.S., click Select to search for your high school by name and state. If your high school is not listed, check the box that indicates ‘My high school does not appear in the list above’. Enter your graduation date or anticipated graduation date (MM/YYYY) even if your high school did not appear in the list. If you not know the diploma type you earned, select ‘Standard’. 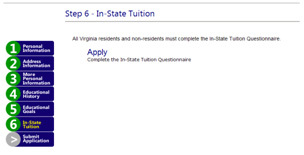 If you are a homeschooled student, select either Virginia or Out-of-State and enter your graduation date or anticipated graduation date (MM/YYYY). If you earned a GED select either Virginia or Out-of-State and enter the date you received your GED award date with month and year. If you attended a high school outside of the U.S. select Foreign High School and enter your graduation or anticipated graduation date. Note: Department of Defense overseas high schools can be selected from the state drop-down under High School Lookup Armed Forces. If you attended any college, click Add a College to enter college data. A search box will appear for you to find your college by state and name. Click Add College and review the information. You can edit or delete your entry. You may add up to five colleges attended by clicking Add a College. If you attended a college in a foreign country, click on the Search Box and check the box for ‘I attended college outside the U.S.’ Enter your attendance dates and degrees earned. If you did not attend any college, skip to Family Educational Background. a. What is your current goal? 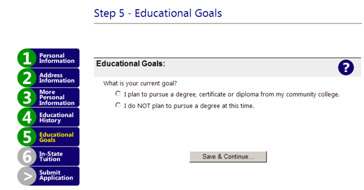 If you want to pursue a degree, certificate or diploma, select a plan from the drop-down box. If you are currently in high school or being homeschooled, you may not select a plan to pursue a degree at this time. Select the option ‘I do not plan to pursue a degree at this time’. If you do not intend to pursue a degree, certificate or diploma, select a reason for taking classes. If you are currently in high school or being homeschooled, you must select one of these options for dual enrollment: 041 (high school & college credit), 042 (college credit only OR homeschool), 043 (both dual credit and college credit) or 04A (adult alternative high schools for students over the age of 21). b. Type of Degrees and Certificates: See the College Catalog or contact a Counselor for details. C. Click Save and Continue. Apply - This takes you to the Domicile Determination Questionnaire, which will determine if you qualify for in-state or out-of-state tuition. 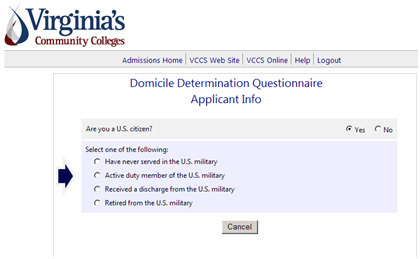 All Virginia residents and non-residents must complete the Domicile Determination Questionnaire. Read each item carefully and select the appropriate answer. When you have completed the questionnaire, click Save. You will receive a summary of the questions and your answers. Confirm your answers and select one of the following options: Continue (proceed to the final submission) or Restart. The submission process will take a few minutes. DO NOT Click Submit Application more than one time. Special Notices - Additional documentation for information that you my required to complete your admission process. Academic Information -- Your assigned plan of study. If you selected a plan of study that requires special admission such as those in Allied Health and Nursing, you will assigned to General Studies. Application Summary -- Print the application summary page so you have a record of all information associated with your application process. How do I apply for Credit Classes and Non-Credit Classes at the same college? A new application must be completed for each ‘Career’. NOVA has two ‘Careers’ - Credit and Non Credit. You can use your temporary login ID and password within 30 days and select ‘Returning User’ and ‘APPLY’ rather than ‘Review’. Prior application means you already have a Student ID. Use your existing Student ID / SIS when applying for another ‘Career’. Information you entered such as name and address will default from your initial application. Select the career for the ‘new’ application - Credit or CEU. Providing your Social Security number is highly recommended. If not given, access to many college services will be limited, and tax reporting information will not be available. Your Social Security number is required when applying for financial aid. How do I apply to more than one community college? A new application must be completed for each college you plan to attend. However, you can use your temporary login ID and Password within 30 days and select ‘Returning User’ and ‘APPLY’ rather than ‘Review’. 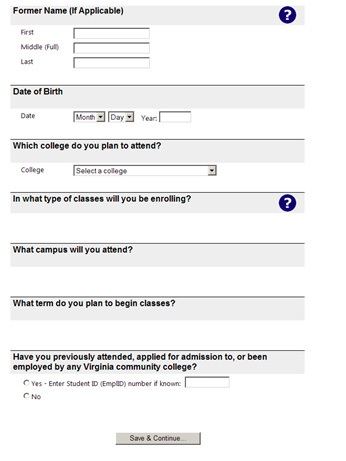 Prior application to or attendance at any Virginia Community College means already have a Student ID. Use your existing Student ID / SIS when applying to another college. If you have more than one Student ID and are unsure which one to use, contact the college you plan to attend. Your current or former name must be entered exactly as it was used on previous applications. Providing your Social Security number is highly recommended. If not given, access to many college services will be limited, and tax reporting information will not be available. Social Security number is required when applying for financial aid. What to do if you are unable to submit an application online or if you have received any error message when trying to apply using the online application? If you receive a scripting error using the online application, please update your browser or use Internet Explorer. Submit a hard copy of the application for admission to any campus Student Services Center for processing. Go to the NOVA home page for the link to print the paper application. Contact the Student Services Center on any NOVA campus for assistance. 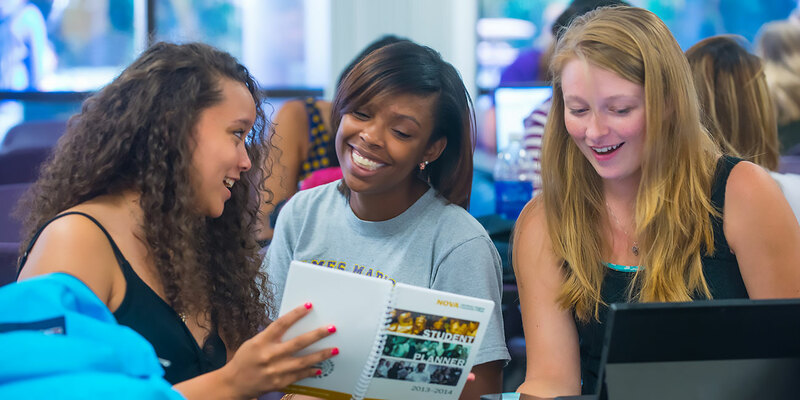 Your next step after applying as a new student is to attend a New Student Orientation (NSO). At NSO you will be advised, register for classes and obtain other important information such as available student resources, your Student ID and parking permit.